12. 02. 2017 13:46 17 (34 - Veiby Ole Christian / Skjærmoen Stig Rune): I was at my maximum here, Suninen did a fantastic job and we pushed him hard all rally. A podium result would still make me very very happy. 11. 02. 2017 16:03 14 (34 - Veiby Ole Christian / Skjærmoen Stig Rune): My driving changes are working well since service. 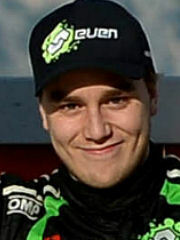 There are still some seconds to go to catch Suninen but we will keep going. 11. 02. 2017 15:01 13 (34 - Veiby Ole Christian / Skjærmoen Stig Rune): I changed my driving style a bit here and it seems to work. 11. 02. 2017 11:04 11 (34 - Veiby Ole Christian / Skjærmoen Stig Rune): Quite difficult this one. Very special and tricky. I did my best, these other guys were quite fast. 11. 02. 2017 10:36 10 (34 - Veiby Ole Christian / Skjærmoen Stig Rune): I tried to push here, it's a stage I know well. Suninen is pushing too. It's a good fight. 10. 02. 2017 18:00 8 (34 - Veiby Ole Christian / Skjærmoen Stig Rune): Some mistakes, two spins but we have shown some good speed today so I'm happy. 10. 02. 2017 15:13 6 (34 - Veiby Ole Christian / Skjærmoen Stig Rune): Quite good but not perfect. Some loose snow outside the tracks but it feels good. 10. 02. 2017 14:10 5 (34 - Veiby Ole Christian / Skjærmoen Stig Rune): I spun just a couple of hundred meters before the finish. 10. 02. 2017 09:53 3 (34 - Veiby Ole Christian / Skjærmoen Stig Rune): A little too careful in here - my family owns the forest near the start so it feels special to be here. 10. 02. 2017 08:43 2 (34 - Veiby Ole Christian / Skjærmoen Stig Rune): Quite surprising because I did some mistakes. A good start through. 09. 02. 2017 20:25 1 (34 - Veiby Ole Christian / Skjærmoen Stig Rune): It was a neat and clean stage for me - I'm happy with that. Very comfortable for now.